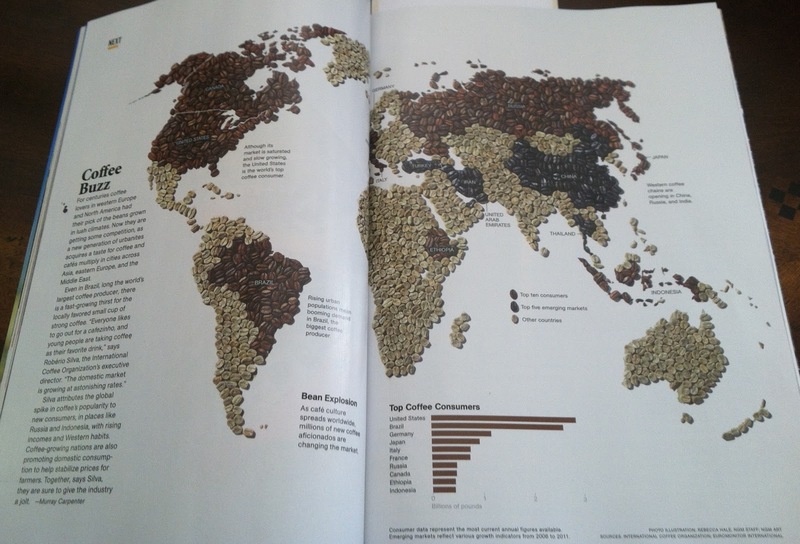 Reading my June issue of National Geographic, there is this two-page map spread showing coffee consumption across the globe, artistically created from coffee beans. Knowing that coffee plantations are typically found in the tropics, I thought it was interesting that the most consuming nations of coffee are outside of the growing regions. There is no question that a lot of deforestation is caused by coffee growers in order to obtain higher yields. Shrinking forests mean less bird habitat. In effect, drinking coffee kills birds. Now I am not a coffee drinker. The faith I practice strongly discourages drinking coffee, among other things. While I don't partake, I've never judged others that do. And I don't consider it a "sin" unless you've committed not to. I used to think that the reason behind my religion's prohibition was strictly a principle of health and spirituality...you know...if you are addicted to and therefore controlled by a substance you are in fact surrendering your own free will. However, after learning about the impact on the rain forests of coffee plantations, I'm wondering if God did not have a greater purpose in the proscription of coffee - saving the planet! There are a lot of things that our modern society overindulges in that negatively impact the environment, and not all are traditional "vices" in the religious sense. Just think about beef, sugar, and beer to name a couple. Look at the impingement on the land required to grow, process, and supply these items at the unnecessary levels of demand we human beings have created. Surely we can all be more temperate in our consumption of such things for both our own health's sake and for the earth's sake. What about the millions of folks in developing countries who depend on coffee growing to feed their families? Ecotourism may be part of the solution for them. What if every coffee drinking birder ditched the habit and saved their daily coffee money and put it toward a birding trip in Central America? That would have a significant economic impact. But would it be enough? Probably not. Hard working coffee growers would have to transition to new industries. I'm not calling for a complete ban on coffee...just a simple reduction in consumption and demand so that more rain forest and therefore birds can be saved from obliteration. At the very least responsible birders and the environmentally-conscious should be drinking certified shade-grown coffee. As for me, I'll continue to abstain. Gracias por la visita de Espana. Un abrazo! You speak the truth Robert...I now buy shadegrown/organic as often as possible, as this is the closest to a win-win situation as its going to get. Don't forget the tremendous amount of water and land used to supply the nation's ridiculous need for beef, chicken, pork, etc...you don't have to go to the tropics to see those effects on the environment. Thanks for your comment Steve. I think shade-grown is the best way to go for coffee drinkers. I'm not opposed to beef, chicken, or pork, in fact I love eating all of it. There is no question that we are over-indulging as a society in those things and the impact on the ecosystems can be gigantic. And I'm just as guilty as anyone when it comes to meat. I want to be more like Pete Dunne...and stop being such a carrion feeder myself. Despite the unfortunate title, the post was a nice call for moderation in all our consumption. Sadly, the list of human agricultural activities that kill birds also includes products that are considered good. Rainforests are felled to grow soybeans, the prairies were plowed under to grow wheat, and California was drained to grow vegetables. The other side of the moderation coin is conservation and management. I'd encourage people to support organizations like TNC, Audubon, ProNatura, and the USFWS that are seeking to keep our remaining avian habitat healthy. Thanks for your comment Tim. The title of the post was intentionally provocative. By employing such a title, I am making fun of the hyperbole used by extreme views on any subject, while in the body of post being my normal moderate self. Soybeans, corn, and many more crops significantly impact the natural ecosystems. Not to mention oil and natural gas. I am not opposed to the use of any of these resources, but hope that we'll be better about making decisions regarding them to lessen the negative effects. Mmmm, birds and beans. BEST coffee!!! I don't drink the stuff, but the spouse goes through a pot every morning and it smells wonderful (and tastes ethically delicious, I suppose). I think God is there too Jeff. So you agree God loves coffee. Settled then. Excellent! I'm not a coffee drinker but I expect tea plants have the same affects, good points. Good point. I had thought about mentioning tea. Tea farming is very similar to coffee. For the bird's sake, I'm glad I don't drink tea either. Im all for bird conservation and wise choices. Abstinence from consumption may be one way to endorse conservation, but it isn't the only way. So hopefully this post will get people thinking about conservation and the birds. We all have the duty to be mindful of the health of the planet - it all adds up after all. I buy fair trade organic coffee only, which I think is shade-grown- and try to keep to a healthy vegetarian diet,buying local produce. Unfortunately that's not going to feed the billions of people - a real conundrum. Robert, I have read this post and all the comments with shades of amusement and disbelief! I am glad most people took it in the spirit in which is was intended. I actually do drink coffee and started drinking more of it after I learned about and tried some of Birds n Beans coffee which does preserve bird habitat and the local economy. As for a belief in God, well every time I see a new species of bird or see a familiar one up close I feel as if God (or Nature if your prefer)were giving me a precious gift. Either way, I am so grateful that there are birds and I like to drink a hot cup of coffee while I am watching them! P.S. your ploy worked. When I was scanning through the archives I just had to see hat this was all about! I really need to come to this site more. There was an interesting question that brought someone to my site, "Do birders believe in God?" Out of curiosity, I searched it myself... This post came up on page one of Google. About coffee, I tried to have organic/shade-grown as often as I can find it. I've been able to locate a couple places in the area that carries it.